Have you ever seen real Faerie Slippers, Faerie Crowns, rings and Magic Wands? That's what you'll see in the Faerie Rings® Collection. 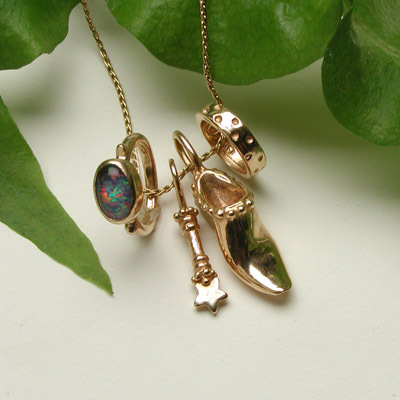 Tiny treasures cast in sterling silver or 14K gold which you wear on a necklace, bracelet or ankle bracelet. Have fun creating your own combination which you can change whenever you want! Faerie Rings® is a whimsical way to reflect your mood or illuminate your inner aspect. I am inspired by faeries and my childlike sense of wonder. Faeries more willingly appear to children than adults because children still see the world in all its possibilities. So it's key to think lighthearted and expect the unexpected. Faerie Rings® are a touchstone to your own magic. Think of Faerie Rings® as a direct connection to the hidden world of faeries, harkening to a world free from limitation. I created Faerie Rings® to allow you to use your own creativity. Arranging your collection of Faerie Rings® into jewelry that reflects who you are or how you feel will stimulate your sense of joy. Let's face it, faeries are just plain fun. What is the significance of the mushroom tag? When I was little I painted designs on top of the freshly sprouted mushrooms to lure the faeries then I hid in the bushes. When I first developed the Faerie Rings® Collection I thought the mushroom would be perfect as a symbol to have on all the necklaces. Later, I learned that there is a species of mushroom called Fairie Rings® that grow in a circle. Folklore claims that mushrooms sprout where the fairies have danced. I can't help but be amused that there is this parallel significance to the name Faerie Rings® --It just shows you that faeries often times reveal themselves to the ordinary world in unexpected ways. Lynette Miller was born Oklahoma City and now has her studio in Dallas, Texas. She studied at Southern Methodist University, Yale University and the School of Visual Arts Painting Program in Morocco. Her jewelry lines reflect a blend of her interest in ancient myth, magical cultures and her rich imagination. Her inspiration for Faerie Rings® springs from her lifelong fascination with the enchanting world of the Faerie and the legendary faerie lore shared by many cultures around the globe. As a child she would look for mushrooms growing in the wild and she'd use watercolors to paint vivid designs on them in hopes of attracting the faeries that she loves so much. Rather than using mined metals, we use "green silver" and "green gold." Those are terms for recycled silver or gold. These recycled metals are still combined with other metals to create sterling silver or 14k gold to the same standards as if used with mined metals. Made in America. That's right. Each piece is individually hand cast and hand finished. We take pride in the quality of our product which doesn't have that mass-produced look. Can I get my order in time for a special day? Generally, because each piece is hand made to order, it takes 4-6 weeks to receive your order... however, we will make every effort to fulfill your order before you need it, if you tell us when you place the order. Please submit your orders as early as possible. Thanks! Entry Page: (aka Home) This web page leads you to the Faerie Rings Collection. There are two ways to go. If you have a broadband connection or a lot of patenaince, you can select the broadband page. To jump right to this month's choices, click the button on the left. From there, it's easy to order. Newsletter...: This is the Faerie News! Check this out each month. It is also accessed through a text button on the top of every page. Boutiques: This is a listing of boutiques that carry the Faerie Rings® Collection. They will have more selection than the web site. E-Mail and Contact Us: E-mail the artist and/or sign up for monthly reminders of the web site updates. The Contact Us rollover on the left menu will take you to a web based e-mail tool. This is handy if you are not at home on your own computer with your regular e-mail access. Site Map: This is the site map for people who like to navigate the site that way. Choices for this Month: This page shows this months selections in a photo above and ordering information below. Featured Combinations by Month: This page allows you to order a preset combination that usually follows theme for that month. How does it work? You can start by collecting just one or you can plunge right in. You'll soon find it's fun having several pieces so you can make a different combination everyday. Faerie Rings® are fun to give, trade and collect! Chains: When you go to the necklace page, choose a necklace style you like, click on the image to bring up the length and price. Each chain has the distinguishing Faerie Rings® mushroom tag. You may want to have a couple of different styles of chains because you can change the entire look of your necklace by changing the necklace style or length. See return policy below. Length: The shortest length is 13" and is offered in one design. This length is meant for babies and small children. The shortest adult length is 16". This fits a medium size person just below the collar bone. The 18" is only a bit longer once it's on your neck. Both 16" and 18" lengths are popular. What is always available? 1) Sterling silver chains and 14K gold chains with the Faerie Rings® mushroom tag 2) Each month of birthstones set in Faerie-size rings 3) Tiny Faerie Wands, Wee Faerie Wands and Fleur-de-Lis Wands. How often does the site change? Monthly, with Faerie Rings of each month available for three months. In other words, the jewelry shown each month can be ordered for up to three months. Then, those pieces may or may not be shown at a later date. What if I missed the time frame for a specific piece? Call or visit the stores which are listed by state or by name under the BOUTIQUES at the top of the page. You can always e-mail me, sometimes I get a few extra peices made of very popular items each month I may still have some available. What if I want to see more designs? Call or visit the retail stores which are listed under BOUTIQUES. What is the "Choice of the Month"? Each month we will feature a special creation with pieces from the Faerie Rings® Collection already assembled and including a free gift box. How long does it take to receive my order? We make the Faerie Rings® to order and we ask that you allow 4-6 weeks for delivery. What metals are used in Faerie Rings®? Sterling silver and 14 carat (solid) gold. A few sculpted boxes are available in cast bronze. Are these pieces cast or stamped out? Each piece is hand cast and finished. Is the shopping cart secure? Yes. We use the Creative Cart shopping cart which employs 128-bit SSL encryption to protect your order information. What are the shipping guidelines? UPS ground, USPS Priority Mail, and UPS International Air. Return Policy We happily accept any items that you have ordered from us with which you are not completely satisfied. Items must be returned with a completed return form to Lynette Miller, Ruidoso Metal Works, 406 Roundtree Place Building 100, Las Cruces, NM 88005 within 30 days (except chains) from the date that we shipped it to you. Items must be unworn and in original condition with all original tags and packaging. We ask that you complete the detailed return form which you can obtain by contacting Lynette Miller at (214) 660-2004. You must pay for shipping, and we recommend that you insure the package. If we do not receive the merchandise we cannot process your credit. When we receive your return we will credit your credit card for the full amount less shipping charges. Please allow 1 or 2 billing cycles for your credit to appear on your statement. All chains are refundable only if returned unworn and in new condition within five days. Faerie Rings is a registered trademark of Lynette MIller.